Julian Stingele, Professor for Cellular Biochemistry at the LMU Gene Center since 2017, receives the "Förderpreis für junge Hochschullehrer" of the Alfried Krupp von Bohlen und Halbach Foundation and is awarded € 1 Million to support his research on cellular DNA repair mechanisms. Julian is an expert in genome maintenance. His work focusses on the cellular mechanisms that resolve DNA-protein crosslinks and restore replication of damaged DNA. The results of his research help us understand cancer development and cellular ageing and may one day contribute to make chemotherapies more effective. 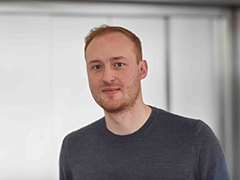 Before establishing his own group at the Gene Center in 2017, Julian worked with Stefan Jentsch at the MPI for Biochemistry in Martinsried and with Simon Boulton at the Francis Crick Institute in London. For more information about Julian Stingele's career and his research projects, please visit the Stingele lab website. Please visit the website of the Alfried Krupp von Bohlen und Halbach Foundation (German only) for more information about the Krupp foundation and read the foundation's press release (also in German).